Snapchat's CEO Claims He Doesn't Fear Facebook. He Should. Snapchat CEO Evan Spiegel struck a defiant tone when an analyst asked him about the threat of archrival Facebook on his first earnings call. But in private, he must be worried: the social media titan has ripped off Snapchat's innovations, and CEO Mark Zuckerberg recently unveiled a plan to cripple his company. Zuckerberg repositioned Facebook as a camera company at the recent Facebook Developer Conference. He revealed plans to create an augmented-reality (AR) platform that developers can use to create and distribute tools and games that work by placing a virtual layer onto the real world. Snapchat's key selling point is that it allows users to jazz up their smartphone photos and videos by warping their faces and adding virtual accessories. "It really sounded like he wants to bury Snapchat", said analyst Richard Greenfield. "So, I think the question that's on every investor's mind is does Facebook scare you, why or why not?" 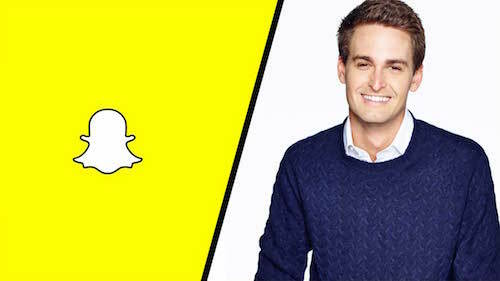 Spiegel replied by trumpeting Snapchat's focus on creativity, then thumbed his nose at Facebook, saying that creative companies have to "get comfortable with and basically enjoy the fact that people are going to copy your products if you make great stuff". Facebook has cloned Snapchat's signature 'Stories' - photo and video montages that disappear after 24 hours - across its website and WhatsApp, Instagram and Messenger apps. Next, Spiegel described how the success of Google and Facebook opened executives' eyes to the importance of search and social strategies, adding that Snapchat's prolific rise is likely to shift their focus to cameras. He concluded by dismissing Facebook's copycatting: "just because Yahoo, for example, has a search box, it doesn't mean they are Google". Spiegel sounded confident and seemed uncowed by Facebook's threat, but he will be watching Zuckerberg closely. Facebook is several times larger than Snapchat, profitable, and has successfully converted users into dollars. Snapchat's daily users increased by 36% year-on-year to 166m in the first quarter of this year; Facebook's base grew at half that rate, but topped 1.28bn in March. Snapchat's first-quarter sales nearly quadrupled to $150m, but soaring costs meant its operating loss widened from about $104m to over $2.2bn. Facebook's revenues grew 49% to north of $8bn over the same period, but its operating income swelled almost two-thirds to $3.3bn. And Snapchat may have tripled its average revenue per user to $0.90, but Facebook's ARPU grew 27% to $4.23. Snapchat's results didn't impress investors, who slashed its market valuation by a fifth to about $21bn, or less than 1/20th of Facebook's valuation. True, Facebook has been a public company for almost five years, but it didn't have to fend off an aggressive incumbent while it found its footing. Facebook's quest to dominate the AR space, and its brazen duplication of Snapchat's signature features, will only make things harder. Spiegel may see Snapchat as a Google, but it could end up a Yahoo.